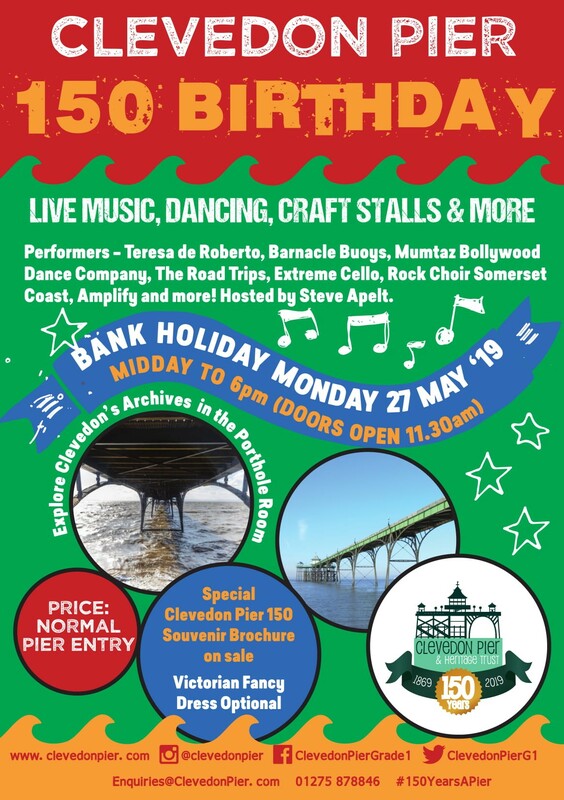 Clevedon Pier celebrates it’s 150 Birthday this year – In addition to all of the usual award winning attractions you can expect lots of exciting events starting with our big Birthday Party on Bank Holiday Monday, 27th May. The Pier’s history has been rewritten in a stunning 32 page A4 laminated booklet. The fascinating story has been brought to life with personal stories and some truly wonderful photographs. Copies of Clevedon Pier: The First 150 Years can be purchased online here, at the Toll House or at Books on the Hill. The first people to buy a copy will be entered into a draw to win a superb painting by acclaimed artist Claire Wright (donated by Fizz Gallery). Click here for details. We will be announcing lots more over the coming weeks so click our news page to get the very latest and don’t forget to join our mailing list (below) for three monthly email updates if that is your preference. Discover @ The Pier – An interactive hands on exhibits about Clevedon, The Pier and the Severn Estuary, which will entertain all ages. Tiffin @ The Pier – superb food , drinks and ice cream at a unique location. The Porthole Room – A unique new function room for parties, weddings, meetings and events. The best fishing for miles around. 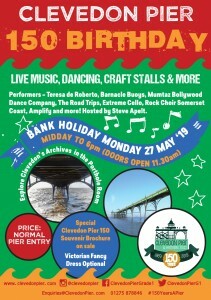 There are always other exciting events and temporary happenings going on at Clevedon Pier. Click here to see what’s on today and the coming months. The Pier has over 14,000 brass plaques. You can buy a Pier Plaque for yourself, family or friends, to celebrate and event or even for your pet! Buy online via our new easy to use shop! Possibly Britain’s most unique and memorable venue to enjoy a seaside picnic (7 days a week), a lovely fish dinner (5 days per week) or cake, ice cream and a drink in the pagoda. To browse menu’s or to book a table at the Award Winning Seafood Restaurant click here. Find out all the latest news first.